Got company in town bring them by the market for a mini tour of the best of Sonoma and great farm to table fare if you want to have a bite. If you’ve had a hankering for Parsons Homegrown -you can get the tomatoes at this Wednesday’s market. Rdegview has beautiful seasonal bouquets. 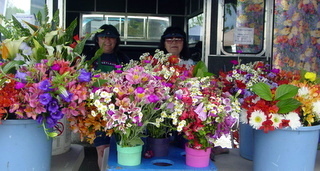 There is always something new and fun to try at the Saturday market. One Ocean Seafood has a mini-oyster bar…you can try before you buy. Beet Generation Farm and Kay’s Bo-Kays are back. Innovative Fabric Creations joins this Saturday’s line-up with cushions for patio furniture. A wide variety of fabrics in the ready-made cushions including SF 49’er logo. Fabic resistent to fading make them perfect for all your outdoor furniture. Custom orders are welcome. Verango Solar returns to the market. Saturday April 5th Vendor List – We have a new look! Saturday the market will have a new look. All vendors certified by the their County Agricultural Department will be grouped together — all the farmers and ranchers. Everyone else – our artisan craftspeople and chefs, bakers and candy makers are also grouped together. Look for the sign at the beginning of each aisle to find your favorite vendors. Or stop by the information booth and we will be glad to point you in the right direction. Our new seafood vendor has wild king salmon from Oregon this week. They welcome special orders. Call a day or two ahead and pick up your order at the Saturday market. One Ocean Seafood 650-222-8685 • fresh@OneOceanSeafood.com. Music in the Food Court by New Skye and on the North side..the amazing Dixie Giants who can’t be contained.